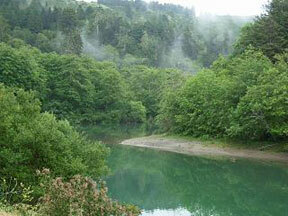 The Navarro River drains a watershed of over 200,000 acres. 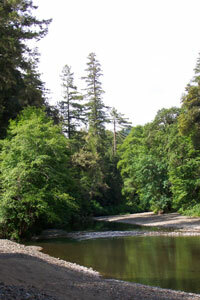 The Navarro River is formed by the confluence of Rancheria, Indian, and Anderson Creeks in the Anderson Valley. The Anderson Valley extends for 25 miles in the middle of the watershed and is named for William Anderson, one of the first white Americans to see the valley. 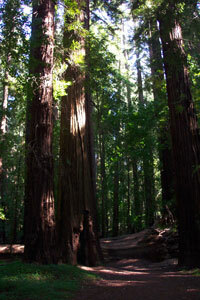 Redwood forest covers the western end, also called the “deep end,” of the drainage, grading eastward into drier oak woodland, chaparral, and grassland. By 1852 a series of small settlements dotted the valley, each with its own church, store, and school. 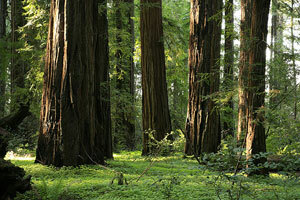 The first logging mill was built in 1857 on the Navarro River. Harvest of tan oaks was also an early occupation. Sheep and cattle ranching were widespread, reaching 75,000 sheep and 20,000 cattle by 1880. Apples did very well in Anderson Valley and by the 1940s over 60 apple driers were operating. Vineyards were first planted by Italian immigrants in the Greenwood area, but with Prohibition and a series of extreme frosts, most vineyards were wiped out by the 1940s. 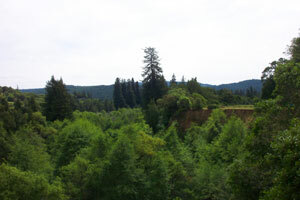 The largest change to the Navarro River drainage occurred with the timber boom of the 1950s. Rapid population growth in California spurred the clear-cutting of most of the forests in the area. Over 50 mills were operating and quickly liquidated the forest into building products, leaving a significant legacy of eroding roads, landslides, and silted streams. After 1973, logging operations became subject to more regulation and resulted in far lower environmental impacts. Vineyards were planted once again in the 1960s. Husch Vineyards, the first modern winery, was established in 1971. The 1980s saw further expansion of wineries and vineyards on former sheep and cattle ranches, apple orchards, and forestry lands. For more information, contact Anderson Valley Winegrowers Association (www.avwines.com) and Yorkville Highlands Growers and Vintners Association (www.yorkvillehighlands.org). The first town of Yorkville was washed away in the flood of 1937. The new and current town of Yorkville was built three miles to the south. Anderson Valley and Boonville in the 1800s. Boonville was once called “The Corners,” located at the intersection of Ukiah Road (now Highway 253) and McDonald to the Sea Road (now Highway 128). Boonville is the largest town in the watershed. Philo was founded and named by Cornelius Prather, who also became the town’s first postmaster. This 62 acre site borders Anderson Creek. Owner Bruce Cakebread has revegetated the entire riparian corridor by planting white alder, Oregon ash, valley oak, black oak, and box elder. See also other Cakebread sites in the Napa River watershed. Named for the confluence of Anderson Creek and Rancheria Creek, which with Indian Creek form the Navarro River, the 53-acre vineyard surrounds the Goldeneye tasting room in Boonville. No-till practices, combined with sediment catchment basins, protect water quality. This 80-acre site sits between Donnelly and Anderson Creeks. The owner, Mary Elke, repaired an eroded bank on Anderson Creek by installing dormant willow sprigs. 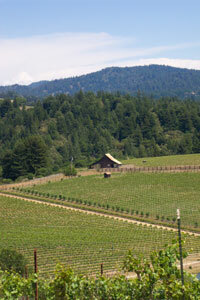 The vineyard is managed to conserve soil and protect the water quality of the two creeks. 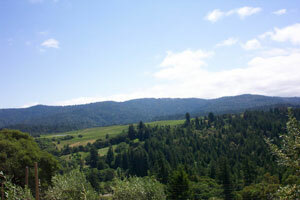 The 66-acre Ferrington Vineyard sits on uplands between the north and south forks of Donnelly Creek on a 165-acre ranch. Cattle and sheep grazing are still practiced on the hilly area of the ranch. The farm plan calls for removal of invasive plants and revegetation of the creek corridor with native plants over time. Gowan Creek Ranch is an 80-acre site in central Anderson Valley. Goldeneye Winery converted the property from a thoroughbred horse ranch into a winery and a 38-acre vineyard, bisected by Gowan Creek. 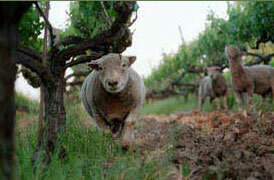 The vineyard is managed with sustainable farming practices, including hosting a flock of sheep in the winter as an effective organic alternative to herbicides and fertilizers, while reducing soil compaction and erosion. 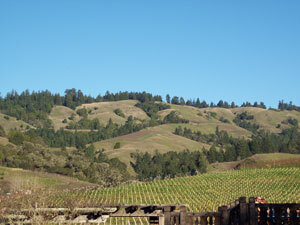 Husch Vineyards was the first winery in Anderson Valley and has vineyards planted in the 1970s on the 23-acre home ranch. Third generation owners Zac Robinson and Amanda Robinson Holstine protect all areas of the vineyard with cover crops and no-till practices. 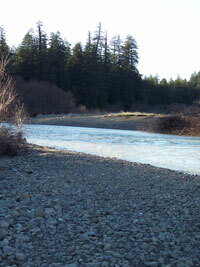 Mill Creek and Lazy Creek form the borders of the property and have well-vegetated riparian corridors. Other sites include Nash Mill Vineyard. This small vineyard borders Mill Creek where a saw mill once operated. 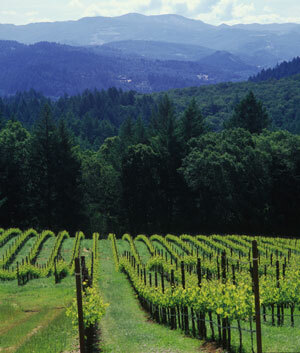 Nash Mill Vineyard is a small 4-acre vineyard nestled in a forested 40-acre site on Mill Creek, north of Whipple Ridge at the edge of Anderson Valley. Zac Robinson manages this vineyard using no-till methods and cover crops to protect water quality in Mill Creek. This site encompasses 40 acres of organically farmed vineyards, originally planted in 1973 on a 90-acre ranch north of Philo and south of Hendy Woods in the northern end of Anderson Valley. The land was tended by a family who farmed it organically since 1999, managing the land to conserve water and prevent soil erosion. Recently it has come under the management of Ferrari -Carano. This winery borders Rancheria Creek. In 2005, owners Matt and Karen Meyer completed a 2500 ft. native plant revegetation project on Rancheria Creek to remove invasive non-native plants and install riparian trees and increase shade canopy for fish habitat. Big-leaf maple, white alder, Oregon ash, California bay laurel, and willow were all planted. 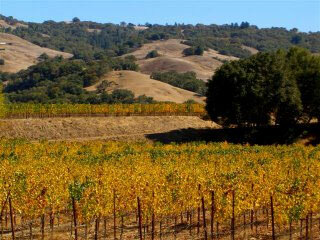 Bill Meyer manages this 2-acre vineyard with cover crops to conserve soil. The Narrows Ranch, formerly Floodgate Vineyard, is a 202-acre site with 52 acres of ridge top vineyards in the cooler northern end of the Anderson Valley. Repairs of roads and drainage at the site has been done to address previous land uses, including redwood logging, and to protect the waters of Floodgate Creek, a tributary to the Navarro River. This 942-acre site was the first property to be certified in the Fish Friendly Farming Program in 2002. The 90 acres of vineyards are in separately fenced areas to allow wildlife such as mountain lions and deer to use over 800 acres of wildland on the property. Ted Bennett and Deborah Cahn founded the winery in 1973 and have planted hundreds of redwood and Douglas fir trees on the ranch. In 2008, a road outsloping project was completed to reduce sediment delivery to creeks. Navarro has received an award from the Fish Friendly Farming program for Light Touch Vineyard Development and Operation. Other sites include: Pennyroyal Farm. This 11-acre vineyard is managed with no-till practices and integrated pest management to protect water quality in the nearby Navarro River. 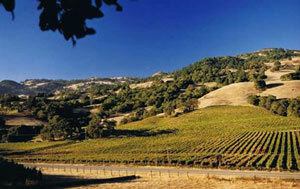 Other sites include Bliss Ranch in the Hopland-Sanel Valley. Raye and Dan Sokolow manage two acres of vineyard on a 20-acre ridge top property, using no-till methods. This small 4-acre vineyard uses integrated pest management and low-volume water irrigation. Bordered by redwood forest and the Navarro River, this 62-acre former Christmas tree farm contains 25 acres of vineyard. It is managed with no-till practices and organic growing methods to protect water quality and wildlife habitat. Also see Schramsberg in the Napa River watershed. 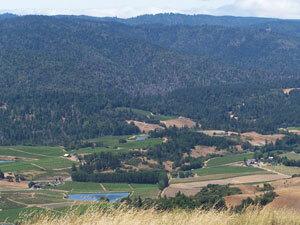 Yorkville Cellars is located in the headwaters of Rancheria Creek, a major tributary of the Navarro River. The 30 acres of vineyard are farmed using organic methods. Owners Deborah and Edward Wallo use miniature Babydoll Southdown sheep rather than herbicides to eat weeds in the vineyard.